Doubles tennis truly is the sport of a lifetime. Young or old, short or tall, fast or slow, doubles can hide many weaknesses. When played correctly, it can level the playing field against opponents that may have an advantage over you in singles. Have you ever wondered why top doubles players who don't even play singles can excel and beat two top singles players who happen to be playing together at a random tournament? Believe me, if the doubles specialists out there could be successful in singles, they would. There is more money and more notoriety in singles. They play doubles because it is not as important how well you strike the ball, or how fast you are. What is important in doubles is good teamwork and an understanding of the game. The number one rule when playing doubles tennis is to find the right partner. Remember, this may not mean the best singles player, but someone who plays at the same or higher level and at the same time compliments your game. For example, if you are a good server and play well around the net, but have trouble breaking serve, find someone that returns serve well and can help you in that department. 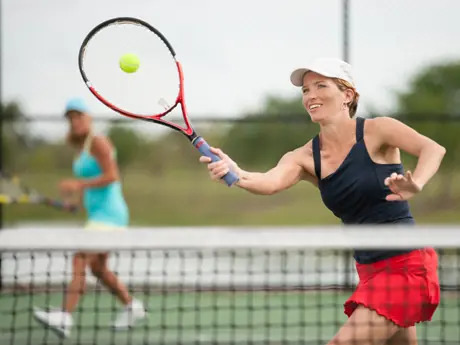 Conversely, if you return well but struggle to hold serve, playing with someone who likes to volley and moves well around the net may be the best choice to help you win your own serve and give you the best opportunity for success. It is also very important to find someone who is compatible from a personality standpoint. If you are the type of person that likes to be in control and call the shots, then playing with someone with similar characteristics may lead to friction. You should find someone who is more open to suggestion and will follow your lead. Dissension among partners is a very difficult obstacle to overcome mid-match, and I'm sure we've all seen matches where it boils over. It's not pretty. At the same time, two players with more docile personalities may not work well together because there is no leader or decision maker. Play can become less cohesive and the energy on court can become flat. So finding the right partner for your game style and your personality is crucial. The most important part of doubles play is the first ball. The serve and return in doubles are the keys to success, and how you play these first balls will decide your fate. When serving, having a high first-serve percentage is essential to holding serve. You will have better results taking a little pace off the serve and serving 70 percent with less aces or service winners than you will serving 40 percent with 10 aces and 10 winners. This is because of the mentality of the returner. On the first serve return, a returner is not looking to be as aggressive or offensive. So even when they are not seeing huge first serves, they are more likely to just put the ball in play and less likely to actually do something with it. This means you are starting on offense 70 percent of the time when serving a high percentage, rather than 40 percent of the time when you are going for the big bomb. The thought process of the returner will change, whether consciously or subconsciously, when receiving a second serve. Now the opponent is looking to do damage with the return and begin on offense themselves. This can mean trouble if your opponent has a decent return. When receiving, the biggest mistake I see is players trying to do too much with the return. This is a singles player mentality and must change when playing doubles. There are two people on the other side of the net, not one. This makes hitting an outright winner very difficult, and will lead to a number of unforced errors and needless mistakes. Make a high percentage of returns and attempt to neutralize your opponent by hitting a deep return if they're not serving and volleying, or something down at their feet if they are coming in behind the serve. This will eliminate "free" points you give away by making careless errors and put you in the best position to win the point. Search for your next tennis event. Nick Bollettieri has coached 10 players who have reached No. 1 in the world, including Andre Agassi, Boris Becker and Martina Hingis. To learn more, visit IMGAcademies.com. NTRP Guidelines: What Level of Player Are You?